Gustaf was now 26 years old. He had peace with the closest and most dangerous enemies. The problem with Poland remained however. Sigismund never stopped claiming his swedish crown back and he continously wrote insulting letters to Gustaf. The cease fire had expired in 1617 and in 1618 the polish had raided Estonia without much retaliation since the swedes were very inferior in numbers. The polish had suffered setbacks nevertheless. The most seriuos at Karkus were over one hundred polish cavalrymen were cut down by Stiernsköld and his men. Poland was the greatpower of eastern Europe. It was the christian watchtower against turks and tatars. At the time it was torn by interior differences and miltarily and politically busy in a war against the sultan. The polish threat against Sweden wasnt immidiate. Thats why Gustaf took the opportunity to attack. He had two reasons. Surely he wanted to be acknowledged as king by Sigismund but more important was the conquest of the rich town Riga and all of Livland (todays Lithuania). The swedish army that he brought was something entirely different than the army his father Karl IX had brought in the failed war of 1605. Since Sweden couldnt afford to build its defence on expensive mercenaries from Europe it was based on swedish men. A sort of early conscription. Every boy over 15 years of age could be requisitioned by the crown for service as a soldier a seaman. The priests were responsible for keeping records of all male inhabitants in each churchvillage. The worlds oldest populationrecord. Out of ten "candidates" one was requisitioned for service. Often the one used was the man the population could spare with the least detriment to their lives. To be drafted was an almost certain deathsentance due to poor hygien and epidemic disease in the camps and garrisons. Many escaped and deserted but then a new candidate was requisioned. Many didnt mind becoming soldiers however. Life was hard in those days and soldiering offered the possibility of loot and booty as well as adventure. Sooner or later the plague or cholera came to the village as well. Death and pain were natural ingriedients in life. The dragoonregiments always had more applicants than vacancies for example. Each part of Sweden was to raise one regiment. This can still be seen in Sweden since the regiments bears the name of the part of Sweden were it is located even today. When the swedish army grew later into over 100 000 men the majority were mercenaries from all over Europe. But the core, the elite units and the leadership remained swedish. The swedish farmboys were silent and used to hardship. Gustaf himself wrote that "they never complained, they were used to heat, cold, hunger and lack of sleep but not to luxuary and pleasure. They were satisfied with little. Obidient, strong and disciplined they could defy all death and evil if properly led". When Poland was attacked the king had 20000 men infantry and 5000 cavalry. Some hired units were present. De la Chapelle had raised a unit of convicted small time criminals, roughians and hooligans as dragoons. The king was sceptical but the unit performed well. De la Chapelle and later his son was very popular but the swedes and finns had trouble with his name, nicknaming him "Laskepelle" instead. The articles of war were severe. The most severe in Europe. The king had been influenced by Grotius book on moral and warfare. It was nothing like the laws of war of today but the intent was to moderate the suffering of civilian populace and maintining discipline. The soldier could face the deathpenalty for 44 violations. A soldier who abused the name of god, drunk or sober, in the precense of three witnesses "should suffer death, without mercy". If he had acted as a clown three times during religious worship he was to be put to death. If he in peace "offered his fist to his superiors" he was to loose the hand. If he did so during war he was put to death. A sentry that fell asleep or was drunk was sentanced to death as well, as was the soldier that entered the camp any other way but through the main gate. A regiment that was routed was trialed and often "decimated". Every tenth man was executed and the regiment stripped of their colors and honorary emblems. They were not allowed to camp within the main camp and were tasked with degrading things such as cleaning and handling filth and dead animals until they had proven themselves worthy. Noone was to put a church, village or town on fire without permission. Penalty by death. Abuse of priest, "ancient" people, women, maidens and children was prohibited. Deserters were hanged immidietly unless there were good reasons in which case his ears were cut off. It may seem extremely harsch. But civilian justice was about the same. The deathpenalty was used for about seventy crimes and crippling was a common penalty. Death and pain were unavoidable companions in a life that was short and unpleasant at best. Gustaf had developed a new army. With the ideas of Moritz of Orania (actually Erik XIV was the first to think in this way) as a base he had developed new tactics and new weaponry that produced combining some features of the spanish school with the dutch methods of Moitz producing the most effective army of its time. While Moritz only started the development and used in ineffectively, only being succesful in sieges, Gustaf perfected it and became one of the most influental and successful comanders of all time. The pikemen recieved shorter and lighter pikes. 3 meters compared to the older 6 meters used by the enemies. They were stripped of their armor except a light harness and a helmet. The enemy wore leg and armarmor as well as a shield. All in mmetal. The muskets were made 2 kg lighter ( 5 kg compared to 7 kg) and were possible to reload and fire. The effective rate of fire as three times that of the enemy. An attempt at a standard calibre was made. The enemys muskets were so heavy that they had to be rested on large forks and the reloadprocedure was made up of eighty counts. The swedish muskets were considered revolutionary. They could be fired four times an hour! Accuracy was about 10% at 200 meters. The imperials later encountered in the 1630:s had many cavaltyunits known as currassiers. They were still clad iron armor as the knights of the late dark ages and the renaicance. Their armor weighed about 70 kg. The swedish cavalry had a harness, at the most! The artillery had been dominated by very heavy guns often at 1500 kg that once depoyed before the battle were static. Thus often falling into the enemys hands if the battle was lost. the swedish army supplemented these heavy guns with lighter pieces (150 kg) regimental guns that were (for its time) mobile and could follow the advancing infantry it was designed to support. Loaded with cannister, ball or grapeshot they had horredous potential, achieving much higher rate of fire than the musketereers. The tactical formation were altered as well. The Tercios of the spanish tactical school were abolished. The tercio was a huge square formation with the pikemen in the core and the musketers forming an outer brim of the square. Containing several thousand men ( 1580 a tercio numbered 3000 men while in 1630 it had only 1200 men) it was a slow lumbering giant with low firepower since only 25% of the musketers faced the enemy at a given opportunity. The strength was in the pure offensive weight in a melee situation. Of course a single tercio cant be outflanked as well. The pikemen were passive targets whatever happened except for that they sometimes lowered their pikes to form a fence around the musketeers. Tactic also made little use of the melee, drawn out firefights were the pikemen were a waste was the common method. The tercio was very vulnarable to artillery firing ball since it was packed so very deep giving the bouncing cannon ball a huge target and the opportunity to maim scores of men standing in the deep squareformation. Gustafs infantry instead used linear formations. These were much more mobile by the quick change from line to column by ordering right or left face. The offensive firepower was greater since 100% of the musketers could fire at the same target. The drawback was the possibility of being flanked and the lack of sufficient men in a melee situation since the stretched line lacked weight at the point of contact with the tercio. The swedsih musketeers were also taught to fire in salvos. All at the same time rather than individually. While the enemys musketers kept a steady stream of fire the swedish unleashed sudden storms of fire at the enemy greatly magnifying the psychological effect. Coupled to the higher rate of fire this was decisive. The crushing effect was used by charging with the pikemen after the salvo with their shorter more maneuvrable pikes and swords. Coupled to the regimental guns it was a good example of cooperatíon between the different functions to achieve maximum effect. It brought back the offensive element to the infantry that the tercios lacked. Since the late dark ages warfare in western europe had been dominated by sieges and battleshad been shunned to the extreme end of it. This was due to the tactic used and the lack of offensive action with the tercios. While the enemys cavalry (except the polish) used the caracolle, the swedish cavalry favored the shock effect of the charge. The caracolle centered on the pistol. In formation of several lines the cavalry rode up to the enemy within effective range of the pistol (about 10 meters) and fired their pistols. After that they rode to the side and back to the rear of the formation reloading their pistols while the next line repeated the maneuver. The name caracolle has a resamblence to carousel for that very reason. This was highly inneffective since the lethality of the pistol was low. The swedes instead advanced on the trot firing their pistols and then charged at full speed with drawn swords into the caracolling enemy disrupting all of their finely tuned timing. The cavalry was supported by units of musketeers making them much stronger defensively since the caracolling enemy came into the effective range of muskets firing salvos followed by a fierce charge by the cavalry. The supporting musketeer units lowered the tactical speed of the cavalry however. The first test of the new army was not a battle however, but a siege.The town of Riga was under polish protection but was independant and actually protestant. On the 11th of August 1621 Gustaf II Adolf reconoittered the town personally and was fired upon from the tower Sandrundeln. The town was defended by a medieval city wall with about 20 towers and a waterfilled moat. The town had a garrison of 300 men but these were reinforced by 3700 men of a home guard style. The town was built on a penninsula. On the 12th the king wrote to the town counsil promising that not a shot would be fired if they only agreed to negotiate. The town replied that no negotiations could be entered without the polish kings permission and that Sigismund was to be informed. If attacked they would defend themselves with any means available. On the 13th the town was surrounded by the swedish army of 19000 men led by the king, the kings brother Karl Filip and Jakob de la Gardie. On the 13th and 14th the swedes entrenched under fire and were attacked by infantry and cavalry where Seaton had managed to built a breastwork. The swedes repulsed the attack. On the 16th the swedes emplaced heavy artillery and the bombardment of the town started. The swedes managed to take the red tower on the opposite beach of the river Duna as well as Ebbenholm despite heavy fire from the Riga flottilla and the Marstallbastion. Cobron immidietly built breastworks at both places. The swedes started to experience a shortage of shoes and socks. On the 18th the swedes opened heavy fire against the Jakobbbastion. The fortification was heavily damaged as well as the eastern parts of the town. The swedes wanted to remove the threat of enfilading fire against their approaching entrenching units. On the 19th the largest Galley was sunk in the harbor of Riga by gunfire from Ebbenholm. 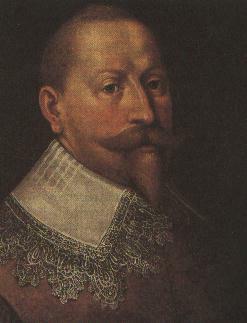 The swedish king was anxious to severe the enemys line of communications via the river with the polish commander Radziwill who was approaching with his forces. The town was completely surrounded by now and defeatism spread in Riga. A letter was sent to Radziwill pleading for immidiate assistance. On the 20th Seaton deployed his guns in front of the Jakobbastion. In the dark another battery was deployed and entrenched to protect them. Seatons and Mansfeldts trenches were now in contact. The enemy was so close that one could speak to them. Losses were heavy on both sides in the heavy fire from musket and cannon. 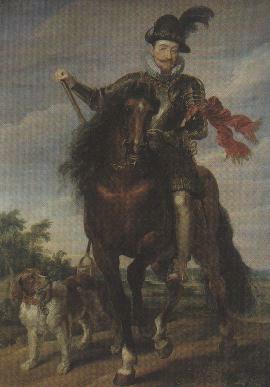 The duke Johan seized Friedrichsholm on the opposite side of the Duna. On the 23rd the swedes took the castle of Dahlen that was situated on a small island in the Duna. The heavy fire against Sandrundeln, the sandtower and the Nyportsbastion commenced on the 23rd. The heavy siegeguns called Kartoger or 42 pounders and halfkartoger or 24 pounders threw projectiles of 19,5 kg respecively 11 kg weight into the target. The thunder continued all day and the 6 meter thick walls of the Jakobbastion was heavily damaged. Many inhabitants were killed in the furious bombardment. On the night to the 24th a messenger was sent from Riga to Radziwill urging for immidiete help. On the 25th the bombardment continued. The fire was shifted from the allready heavily damaged Jakobbastion to the Sandtower and Nyportbastion.From Cobrons entrenchment by the red tower and the Ebbenholm fire was directed across the river at the riverside of Riga. The towncounsil mansion was destroyed by this fire. In the night the swedes tried to attack across the river and take the Marstallbastion by surprise but failed. The heavy artilleryfire continued until the 29th when it got the charachter of surveillance. Some of the fire was constituted of mortars firing incendiery rounds from entrenchments around the town. The artillery in the Jakobbsation was neutralized and the gates in the Sandtower were detroyed. The halfmoonshaped breastwork in front of Sandrundeln was also under fire. Despite all this the defenders repaired as much as possible by night. The heavy firing had led to some of the guns cracking and blowing up killing some of the swedish gunners. A messenger from Radziwill managed to sneak through the swedish lines and deliver a message promising imminent help. New hope emerged in the town. An attempt to fill the moat with fascines failed as did an attempt to cross the moat in small boats. On the 30th Wrangel attempted to storm the halfmoon at the Marstallbastion but was repulsed with heavy losses. By late afternoon Rasziwill arrived with 1500 men and three guns. A small battle evolved on the riverbank between Kiska and Cobrons men. Radziwill joined Kiska but despite early gains he was forced to withdraw due to the density of swedish entrenchments and guns. He withdrew to the hills and encamped. The forces in Riga were enthusiastic and tries to establish contact with Radziwills forces. An attempt to cross the river in boats became a bloody failure. When Swedish gunfire was directed at Radziwills camp he realized the futility in attempting to lift the siege with his small force and departed on the 31st. He sent an encouraging letter to the defenders of Riga and left. On the night to the 1st of September the swedes managed to lead off the water from the moat. This made it possible to cross the moat in front of Sandrundeln and take the halfmoon entrenchment. Heavy artillery fire was directed at the Sandrundeln. Swedish miners crossed the moat to dig a tunnel under the halfmoon. The defenders themselves had dug a tunnel to intercept the swedes. On the 2nd the swedish king wrote to the defenders telling them negotiate for surrender. When no reply was recieved he ordered an attack. Herman Wrangel took Mansfeldt regiment and crossed the moat, seizing the halfmoon after a short but intense fight. A wellcalculated minedetonation caused Wrangel heavy casualties. The swedes continued to try to seize Sandrundeln. In front of the Jakobbastion the swedes dug trenches and built breastworks from which handgrenades could be thrown in over the bastionwall. The defenders worked admirably to repair the damage done. On the 3rd and 4th the intensity in artilleryfire increased against the Jakobbastion. Its breastwork being partly destroyed. It is said that both Gustaf II Adolf and his brother Karl Filip participated in the trenchdigging with shovels in hand. An attempt to launch an assaultbridge failed on the night of the 5th. The minedigging continued and meant that the antagonists found themselves in melee with sword, axe and handgrenade. On the 8th the swedes had managed to undermine the halfmoon but despite supporting fire from nine batterys they were unable go on due to the intense fire from the Jakob- and Nyportsbastions. Minediggers met in furoius melees beneath the earth. On the 9th heavy artilleryfire supported another attempt go forward through the tunnels beneath the halfmoon. Mansfeldt succeded and a petard was used to blow a gate between the rundeln and the halfmoon. The swedes reached the Sandrundeln. Gustaf Horns regiment stormed the halfmoon and approached the Sandrundeln to seize it. Another swedish force blew a gate with a petard, stormed through it and reached the breastwork of the Jakobbastion. They were forced to leave the breastwork due to intense fire from the sides of the Jakobbastion and Nyportbastion. The swedes suffered 200 casualties on the 9th while the defenders lost half that number. The successes meant that the mining under Sandrundeln could continue and a new assaultbridge was readied for use at the Jakobbastion. The king was ready to order another assault. On the 12th Gustaf II Adolf wrote the defenders a third time, urging a surrender within 6 hours. Negotiations ensued and on the 15th the defenders surrendered. A large mine was ready to blow the towngate and several assaultbridges were in place while only a handful of defenders remained. The campaign in Livland continued despite a shortage of supplies. On the 20th Dunamunde castle surrendered to Wrangel while Riga was repaired. On the 27th the king led a force towards Mitau, the capital of Kurland. The town was siezed on the 2nd of October. Radziwill had withdrawn to Bauske and marched to protect Mitau but was too late and deployed at Annenburg. The swedes prepared for battle at Annenburg but Radziwill withdrew and the swedes turned back to Mitau. Cobron won minor victories on his marsch to Kokenhausen but was surprised by polish forces and scattered. The king besiged and siezed Wolmar from the 23rd to 26th of December. His brother had fallen seriously ill and Poland had signed a peacetreaty with Turkey. They were starting to mobilize to fight the swedes.